The Adonia's arrival is the first step toward a future in which thousands of ships a year could cross the Florida Straits. 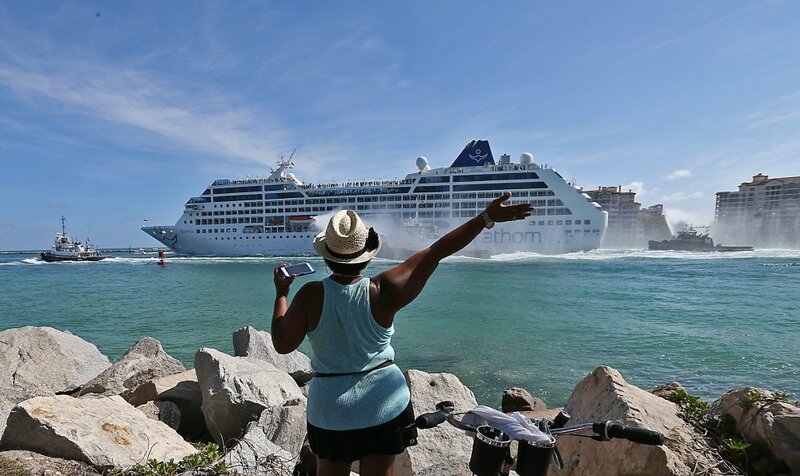 HAVANA – The first U.S. cruise ship in nearly 40 years was crossing the Florida Straits from Miami to Havana on Monday, restarting commercial travel on waters that once represented a half-century of Cold War hostility. The 704-passenger Adonia was to finish its nearly 17-hour journey at 9:30 a.m. EST, becoming the first U.S. cruise ship to dock in Havana since President Jimmy Carter eliminated virtually all restrictions of U.S. travel to Cuba in the late 1970s. Travel limits were restored after Carter left office and U.S. cruises to Cuba only become possible again after Presidents Barack Obama and Raul Castro declared detente on Dec. 17, 2014. The Adonia’s arrival is the first step toward a future in which thousands of ships a year could cross the Florida Straits, long closed to most U.S.-Cuba traffic due to tensions that once brought the world to the brink of nuclear war. The straits were blocked by the U.S. during the Cuban Missile Crisis and tens of thousands of Cubans have fled across them to Florida on homemade rafts – with untold thousands dying in the process. The number of Cubans trying to cross the straits is at its highest point in eight years and cruises and merchant ships regularly rescue rafters from the straits. Before the 1959 Cuban revolution, cruise ships regularly traveled from the U.S. to Cuba, with elegant Caribbean cruises departing from New York and $42 overnight weekend jaunts leaving twice a week from Miami, said Michael L. Grace, an amateur cruise ship historian. New York cruises featured dressy dinners, movies, dancing and betting on “horse races” in which steward dragged wooden horses around a ballroom track according to rolls of dice that determined how many feet each could move per turn. The United Fruit company operated once-a-week cruise service out of New Orleans, too, he said. “Cuba was a very big destination for Americans, just enormous,” he said. Cruises dwindled in the years leading up to the Cuban Revolution and ended entirely after Castro overthrew the U.S.-backed government. After Carter dropped limits on Cuba travel, 400 passengers, including musical legend Dizzy Gillespie sailed from New Orleans to Cuba on a 1977 “Jazz Cruise” aboard the MS Daphne. Like the Adonia, it sailed despite dockside protests by Cuban exiles, and continued protests and bomb threats forced Carras Cruises to cancel additional sailings, Grace said. The following year, however, Daphne made a several cruises from New Orleans to Cuba and other destinations in the Caribbean. Cuba cut back on all cruise tourism in 2005, ending a joint venture with Italian terminal management company Silares Terminales del Caribe and Fidel Castro blasted cruise ships during a 4 1/2 hour speech on state television. “Floating hotels come, floating restaurants, floating theaters, floating diversions visit countries to leave their trash, their empty cans and papers for a few miserable cents,” Castro said. Today, the Cuban government sees cruises as an easy source of revenue that can bring thousands more American travelers without placing additional demand on the country’s maxed-out food supplies and overbooked hotels. Before detente, Americans made surreptitious yacht trips to Cuba during Caribbean vacations and the number of Americans coming by boat has climbed since 2014, including passengers on cruise ships registered in third countries and sailing from other ports in the Caribbean. Traffic remains low, however, for a major tourist attraction only 90 miles (145 kilometers) from Florida. Aiming to change that as part of a policy of diplomatic and economic normalization, Obama approved U.S. cruises to Cuba in 2015. The Doral, Florida-based Carnival Cruise Line announced during Obama’s historic trip to Cuba in March that it would begin cruises to Cuba starting May 1. Unexpected trouble arose after Cuban-Americans in Miami began complaining that Cuban rules barred them from traveling to the country of their birth by ship. As Carnival considered delaying the first sailing, Cuba announced April 22 it was changing the rule to allow Cubans and Cuban-Americans to travel on cruise ships, merchant vessels and, sometime in the future, yachts and other private boats. Norwegian Cruise Line says it is in negotiations with Cuban authorities and hopes to begin cruises from the U.S. to Cuba this year. Cruise traffic is key to the Cuban government’s reengineering of the industrial Port of Havana as a tourist attraction. After decades of treating the more than 500-year-old bay as a receptacle for industrial waste, the government is moving container traffic to the Port of Mariel west of the city, tearing out abandoned buildings and slowly renovating decrepit warehouses as breweries and museums connected by waterfront promenades. Cruise dockings will be limited by the port’s single cruise terminal, which can handle two ships at a time. Carnival says the Adonia will cruise twice a month from Miami to Havana, where it will start a $1,800 per person seven-day circuit of Cuba with stops in the cities of Cienfuegos and Santiago de Cuba. The trips include on-board workshops on Cuban history and culture and walking tours of the cities that make them qualify as “people-to-people” educational travel, avoiding a ban on pure tourism that remains part of U.S. law.